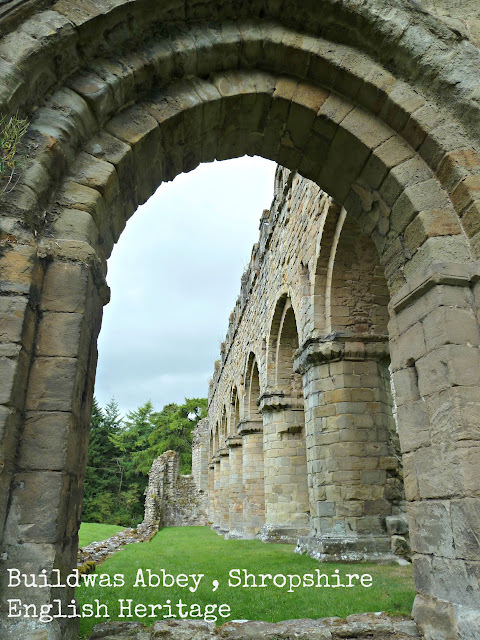 Visiting Buildwas Abbey an English Heritage property between Ironbridge and Much Wenlock has been on my list of places to visit for sometime. It is a place I pass frequently, but not always open on a date convenient for a visit. Having picked up my aunt, my sister and I headed off on our day out, complete with picnic. The weather did not make a promising start, I had been hoping for blue skies and sunshine, instead it was cloudy with the odd shower of rain. We arrived around 11am with just a few cars in the car park, although the car park is small. A member of English Heritage welcomed us from the hatch of her small hut. There is no audio tour for this site, although you can buy a guide book. My aunt already had the guide book, unfortunately it was left at home, still not to worry I had my English Heritage phone app to refer to. The ruins of the abbey are on a small site, along with a short nature walk. There are also private garden to tour, however this is only open on selected days. The Buildwas Abbey site contains the ruins of a Cistercian abbey and a unaltered 12th century church. The intact tiled floor in the Chapter House with its vaulted ceiling was very impressive. To think of the work that must of gone into creating them, they were in good condition considering the age of the site. You could make out different designs and patterns. There are no dedicated paths around the site, as you would expect around an ancient abbey ruin, so it can be a little uneven. There are also a set of steps up to the entrance hut. They have two portable toilets, one unisex the other a disabled toilet. They were in good condition. Some drinks and snacks along with some limited English Heritage merchandise, are available at the entrance hut. In the grounds there are a number of benches and picnic tables, which we did our best to put to use with our picnic between the showers. It was at this point we decided to head to Much Wenlock just a few minutes in the car for a cup of tea and cake. Queue sunshine, isn't that just typical. I will share with you soon my new tea room discovery in Much Wenlock along with my visit to Shipton Hall. You can find out more information about opening times and entrance costs on the English Heritage website. Sounds like a wonderful day. I love visiting the English Heritage and National Trust sites. My hubby is a professional photographer and does get fed up with the National Trust though as they don't allow you to take photographs in a lot of their places, so he favours the English Heritage who do allow you to.